GenJet™ DNA In Vitro Transfection Reagent for MEFs is pre-optimized and conditioned for transfecting Mouse Embryonic Fibroblasts (MEFs). MEFs are required to support the growth of undifferentiated mouse or human ES cells, iPS cells, thus they are also called feeder cells. MEFs are isolated from mouse embryos and are used at their early passages. Before MEFs are used as feeder cells, they must be treated by irradiation or mitomycin C to stop the cells from further dividing. However MEFs are nortoriously hard to transfect. With the pre-optimized reagent, you will get up to 85% GFP+ MEFs. 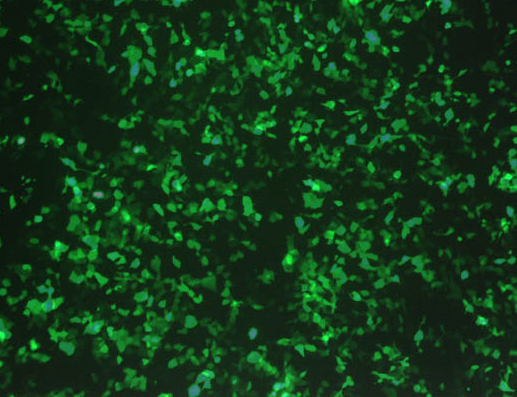 The "Shaved Cell Transfection" protocol was optimized to achieve maximal transfection efficiency. Refer to the following optimal transfection conditions for maximal transfection efficiency on MEFs cells. GenJet™ reagent, 1.0 ml, is sufficient for 500 transfections in 24 well plates or 250 transfections in 6 well plates.